Stitch patterns have their own unique set of characteristics and it can sometimes be challenging to figure out the steps involved in recreating each one by grafting. Of course, it helps if someone has already done the work for you (if you’re a sock knitter, you’re probably familiar with the steps required to recreate stockinette stitch, a process sometimes known as Kitchener stitch). But you may have to do a bit of searching to find tutorials for grafting other types of patterns, which is where the brioche stitch comes in. After studying grafting for the last few years, I’ve discovered that all kinds of stitch patterns can be recreated using a tapestry needle and a strand of yarn: from plain knit and purl combinations such as stockinette stitch, garter stitch, and ribbing, to more complex patterns containing cables and twisted stitches, and yarnovers and decreases for recreating lace patterns. I love to see how many different types of stitch patterns I can graft invisibly by recreating them exactly (as opposed to simply joining them with Kitchener stitch). I have to admit, part of me just loves the challenge of figuring out if it can be done, but the skill also comes in very handy when I’m grafting two sets of live stitches together for a cowl and want the join to be as invisible as possible, or if I’m trying to make an adjustment or repair to an existing garment. But there’s one stitch pattern that (until now) I’ve found somewhat difficult to recreate: brioche stitch. Brioche stitch has a more complex structure than any of the aforementioned brioche stitch patterns because each row actually consists of two rows that intersect with each other. This interwoven structure makes it impossible to recreate the stitch using only one strand of grafting yarn. I pondered this problem on and off over the last couple of years, each time putting it aside because I just couldn’t figure out a solution. But then a brioche knitting pattern, Caen Cowl by Deborah Helmke, arrived for our new Knitscene Fall issue, and I thought it might be a good time to tackle the brioche grafting issue once and for all. And this time, it clicked! The solution turned out to be much simpler than I’d thought. It occurred to me that, if I couldn’t recreate the stitches using one strand of yarn, I should try using two. After that, it was a breeze. 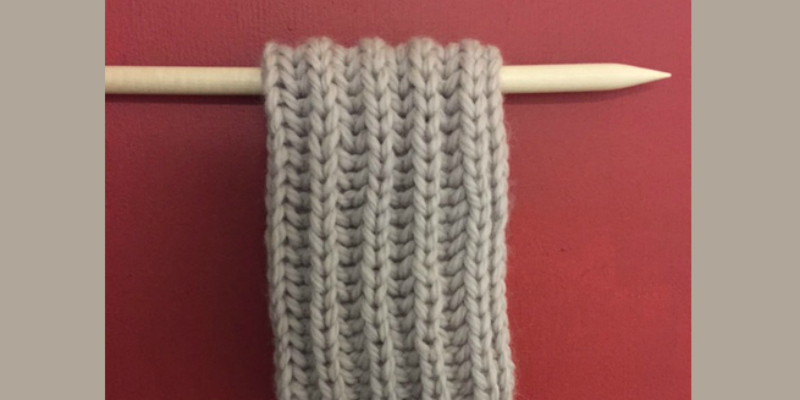 The cowl is worked over an even number of stitches (which is the easiest form of brioche to work because after the set-up row, every row is worked exactly the same). Working the brioche stitch results in a ribbed fabric, and I simply followed the path for the purl stitches with one strand and then followed the path for the knit stitches with the other strand. I also had to make sure that the provisional cast-on had a combination of knit stitches and yarnovers. If you’ve ever wanted to graft brioche knitting, give the grafting a try on a smaller scale by knitting this soft, cushy ear warmer. 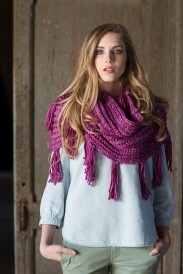 Once you’ve seen how easy it is, try it on a larger project like Deborah’s cowl! 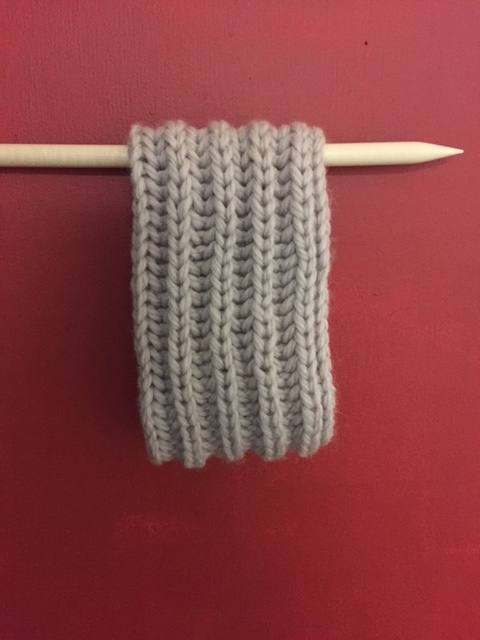 Provisional cast-on: Using waste yarn and crochet hook, and the crochet chain edge provisional method, CO 12 sts onto the knitting needle, and then work a few more chains off the needle (the ear warmer will be worked over 10 sts). Break the waste yarn and pull the yarn through the last loop to secure the chain. With the working yarn and knitting needle, and leaving a 24–26″ tail for grafting, work the chain sts on the needle as follows: *Knit one chain stitch (counts as first stitch), yarnover (counts as second stitch), and drop one chain off the needle; repeat from * four more times for a total of ten stitches cast on. To anchor the last yarnover, knit one more chain stitch (a stitch will be decreased on the next row, bringing the stitch count back to ten). Turn the work. Set-up row: *With yarn in front, slip one purlwise, bring yarn over right needle and knit into yarnover from first pass; repeat from * three more times, then with yarn in front, slip one purlwise, knit last stitch and yarnover together—10 stitches remain (not counting the yarnovers). Next row: *With yarn in front, slip one purlwise, bring yarn over right needle and knit next stitch together with the yarnover; repeat from * to end. Repeat this row until the ear warmer is the desired length, ending so that the working yarn is on the same side as the grafting tail from the cast-on row. Break the yarn, leaving a tail the same length as the cast-on tail. Run a strand of waste yarn through the stitches. Don’t remove the waste yarn chain from the cast-on stitches. The stitches will be grafted with the chain in place and it will be removed after all the stitches are grafted. Bring the two ends of the ear warmer together, with the piece holding the live stitches below the stitches of the provisional cast-on and the grafting tails at the right edge. The stitches will be grafted in two passes. On the first pass, the cast-on tail will be used to graft only the five purl stitches and the yarn will be carried over each knit stitch/yarnover pair on the lower piece. Leave the strand of waste yarn in the lower stitches until the second pass. On the second pass, the working yarn will be used to graft only the five knit stitch/yarnover pairs and the yarn will be carried over the purl stitches on the lower piece. Remove the waste yarn from the lower piece as you go. Step 1 Insert the tapestry needle from front to back into the first purl stitch on the lower piece. Step 2 Insert the tapestry needle through the V on the upper piece (following the path of the yarnover from the cast-on row. Step 3 Insert the tapestry needle from back to front into the purl stitch on the lower piece. Step 4 Pass the yarn over the next knit stitch/yarnover pair on the lower piece by inserting the grafting yarn behind both legs of the knit stitch from the provisional cast-on row. Repeat these four steps across. Step 1 Carry the yarn over the next purl stitch by inserting the tapestry needle behind the V that was created on the first pass. Step 2 Insert the tapestry needle from back to front into the next knit stitch/yarnover pair on the lower piece (making sure you go through both). Step 3 Insert the tapestry needle behind both legs of the knit stitch from the provisional cast-on row (following the same path as in Step 4 of the first pass). Step 4 Insert the tapestry needle from front to back into the knit stitch/yarnover pair on the lower piece. Remove the chain from the cast-on stitches. And that’s it! Perfectly grafted brioche in a few easy steps. If you want to knit the Caen Cowl from Knitscene Fall 2015, you can download the digital issue now, or pre-order the kit with all the yarn you need to make your own!